My dad was, and probably still is, the very opposite of wasteful. He had a bucket in the shower to collect the cold water before you got in, and used it later for flushing the toilet. He'd put on more clothes, rather than turning on the heater. Food scraps would be eaten where possible, or else taken out to compost. It pains me just as much to throw food away, which is why I have experimented with eating carrot tops, and cooking with sourdough starter which no longer smelt right. The other night, I made a chili using tinned red kidney beans, and suddenly recalled reading about a recent discovery involving the bean liquid: named aquafaba, it turns out the thick and frothy brine can be whipped up just like egg whites! While chickpea water has the most neutral flavour, I decided to try making meringues with the red kidney bean liquid I had on hand. What started out as a reddish-brown gloop became paler as it aerated in the food processor. Red kidney bean liquid before whipping. The original recipe from Goose Wohlt only calls for 1/2 cup sugar and the liquid from one can of beans, but I didn't seem to be able to get the ingredients to form stiff peaks, so I added cream of tartar and vanilla as well, based on the recipe from Kids with Food Allergies. It took me half an hour to realise I had left the food processor blades in, before switching to the whisk attachment. Mixture became pale and thick after whipping. Using the egg whisk gave a much fluffier result, but I still couldn't get the mixture to form stiff peaks, and my food processor was getting hot. I went ahead and spooned the whipped concoction onto baking paper and put it in the oven anyway. Depending on which recipe you pick, you are supposed to bake the meringues at 100C/200F for 1.5 hours, 120C/250F for 40 minutes, or use a mix of temperatures. I baked mine at 100C for 1 hour, then turned off the oven and left them inside overnight. Because I didn't put my meringues into an airtight container in a timely manner, I baked them again the next day to dry them out properly. You need to wait for them to cool first, not just to avoid the moisture being trapped in the storage box, but also because they are soft and sticky while warm—I tried pulling one off the baking paper straight away and the bottom stuck, but those which I removed after cooling slid off effortlessly. Aquafaba meringue stuck to baking paper while warm. I'm not sure why the surface of my meringues seemed to have little circles on them, but the result was light and crunchy. Overall, I think they were actually closer to hokey pokey than meringues, because they stuck to your teeth when you ate them, and there seemed to be a bit of malt or caramel flavour. The aquafaba meringues were light and crunchy. 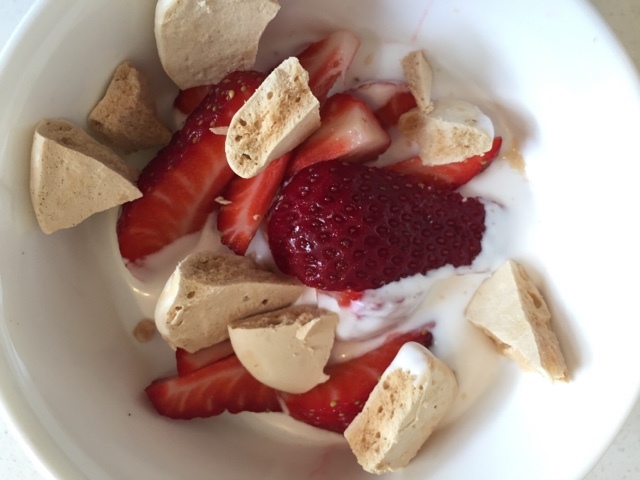 Breaking the crunchy bits over fresh strawberries and coconut yoghurt greatly reduced the teeth-sticking, and made a tasty vegan and gluten free dessert. Aquafaba meringues with strawberries and coconut yoghurt. You can also use it as an egg substitute (including as egg wash) by replacing each egg in many recipes with 3 Tbsp aquafaba. I was pleased with how my meringues turned out, and amazed by their transformation from a slimy liquid into light and crunchy pillows. I would be tempted to retry these with chickpea brine, and see how aquafaba works in savoury recipes as well. No more tipping bean liquid down the drain—my dad would be pleased! This post is part of Our Growing Edge, a monthly blogging event aimed at inspiring us to try new things. This month, it is hosted by Jazzmine from Dash of Jazz, with a theme of Nostalgia. Ah, that probably explains it - thanks! It was cold when I started, but by the time I realised I had left the blades in, it would have been rather warm!